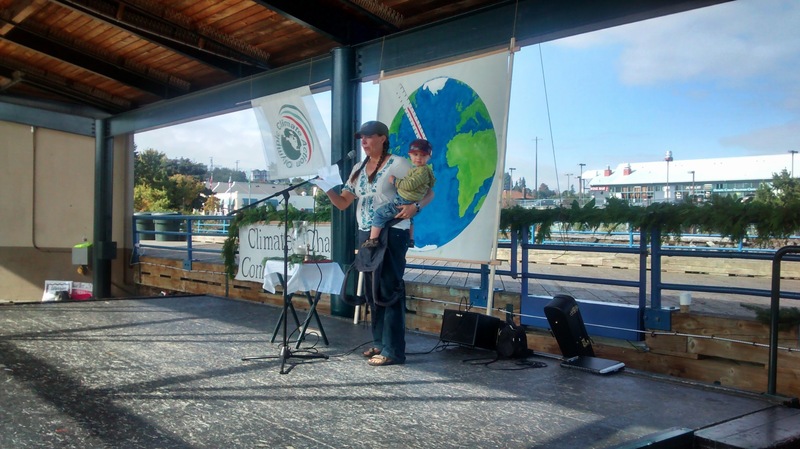 The people of the Olympic Peninsula, like the people of Washington State and the United States, want to address climate change. $32 million of Big Oil money does not deny that fact! This entry was posted in All, Stories/News and tagged attitudes, Clallam County, Jefferson County, Olympic Peninsula, opinion, survey on 2018/11/18 by olyclimate. The People’s Climate March is a nationwide event to re-energize and build the movement for climate action in order to fight pollution, protect human rights, and transform our economy. Here on the Olympic Peninsula, we have the opportunity to build a coalition of communities and cultures dedicated to a just transition toward community resilience. Climate action here can mean moving toward stable jobs with good wages, building and retrofitting infrastructure to generate our own energy, increasing efficiency, and preparing for climate changes to come. Together we can achieve a better future for us all. This is why we are concentrating our efforts into a joint march for the whole North Olympic Peninsula. This is our Peninsula, our future, and our climate. In addition to climate action on the Peninsula, we stand up to protect the recently signed Paris accord, in which nations work together to limit global warming to 1.5 degrees C, and thereby hopefully sustain a livable planet. We reject the call by members of the current federal administration to pull out of the Paris agreement and unleash a new wave of unnecessary and lethal fossil-fuel extraction. The Sierra Club North Olympic Group and Olympic Climate Action invite you to join us. Let’s march together for our future. We have a great lineup of speakers and others to inform and inspire you! We use non-violent means to achieve change. We are committed to nonviolence, inspired by the spirit of Gandhi, Martin Luther King Jr., and other peaceful protesters before us. No violence, no property damage. We believe that this approach offers the best means of creating lasting progress toward a just and healthy world. 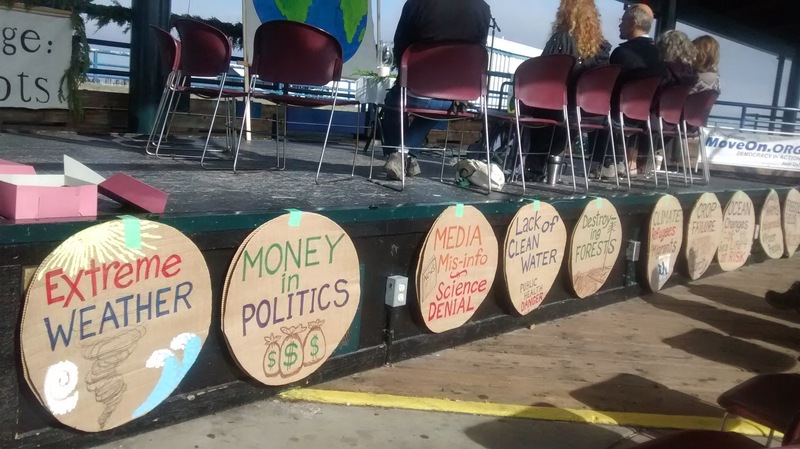 This entry was posted in Actions, Events and tagged Olympic Peninsula, People's Climate March, Port Angeles City Pier on 2017/04/27 by olyclimate. On the weekend of Sept. 20-21, people around the world will gather for what promises to be the biggest climate demonstration in history, centered upon the People’s Climate March in New York City on Sept. 21, two days prior to a special climate summit being called by United Nations Secretary-General Ban Ki-moon, where world leaders (not just their climate negotiators) will be called upon to get serious about a world climate action plan. 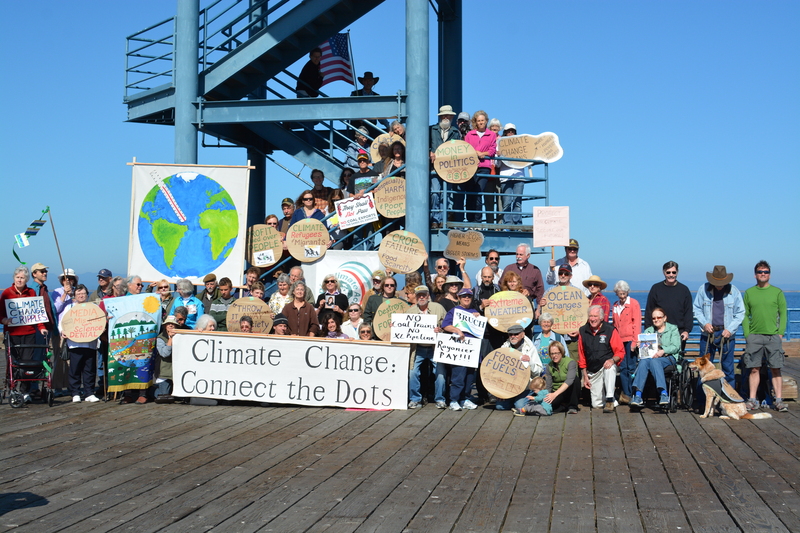 On Saturday, September 20, 2014, from 10 a.m. – 1 p.m., beginning and ending at the Port Angeles City Pier, OCA, along with other community groups, will lead a vigil, rally, and march. The visuals will center around a large painting of Earth which will be visually connected by ribbons to smaller “dots” with phrases suggesting the surrounding issues. These images will be carried in a long line during the march and then displayed in sunburst fashion, with Earth at the center, for a photograph with marchers at the City Pier observation deck. On Saturday, Sept. 20, OCA member Bob Lynette will give a talk on climate change and its local impacts at the Dungeness River Audubon Center from 10-1. Following his talk, OCA members will lead a brief march and photo shoot in support of the worldwide mobilization. 401: The peak concentration of carbon in the atmosphere (in parts per million) measured by the world’s leading scientists this spring — higher than any time in human history. Zero: The amount of progress we’ll make if we stay home. There’s no guarantee this will work. The only thing that’s for sure is if we stay home, nothing will change — except the climate. More than 2000 events are being planned around the world, in 130 countries…let’s do our part on this beautiful corner of the planet! As a lead-up to these solidarity actions, Disruption weaves together political intrigue, mind-blowing science, and an insider’s view of the largest climate mobilization in history. It features Bill McKibben, Naomi Klein, Van Jones, and some fresh faces with powerful new stories. Watch it here. 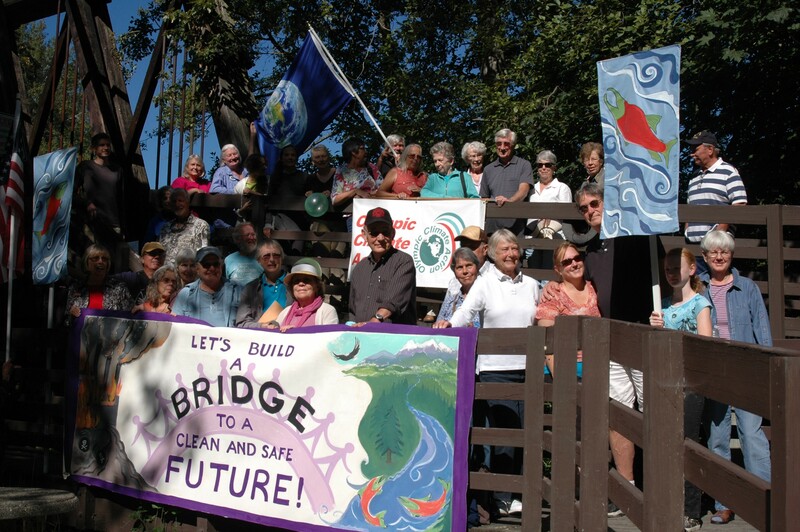 This entry was posted in Actions, Events and tagged Olympic Peninsula, protest on 2014/09/11 by olyclimate.